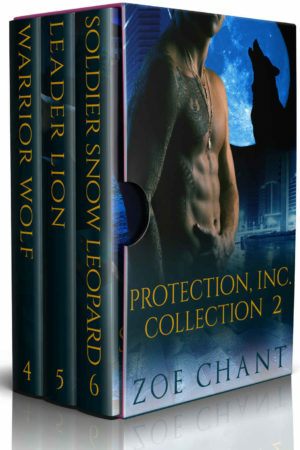 Brave, passionate, and loving, the shifter heroes of Protection, Inc. will do anything to protect their mates. There's no danger they won't face. But can they take the biggest risk of their lives, and open their wounded hearts to love? Combining sizzling romance with laugh-out-loud humor and fascinating mythology, the Protection, Inc. series is a must-read for fans of T. S. Joyce, Terry Bolryder, and Lisa Ladew. With 400+ five star reviews, 35,000+ copies sold, and over 10 million Kindle Unlimited page reads, these spellbinding books have captivated paranormal romance readers worldwide. Save 30% with this convenient collection of three complete novels. Absolutely no cliffhangers! Warrior Wolf. She’s a runaway dragon princess. He’s her ex-gangster werewolf bodyguard. That couldn’t possibly go wrong. Leader Lion. A tough lion shifter bodyguard hiding a lonely heart and the determined stage manager he'll protect with his life face the biggest challenge of their lives: love. Soldier Snow Leopard. True mates on the run. Both with secrets they've never revealed. Both sworn never to love. Discover the brave and passionate shifters of Protection, Inc. in this collection of thrilling romance novels! If you love paranormal romance with strong women and tough men, scroll up and one-click today!